Just watching "World Richest Dogs"
Although my dogs are not anywhere near rich, they are defiantly close to being as spoilt as these pups! 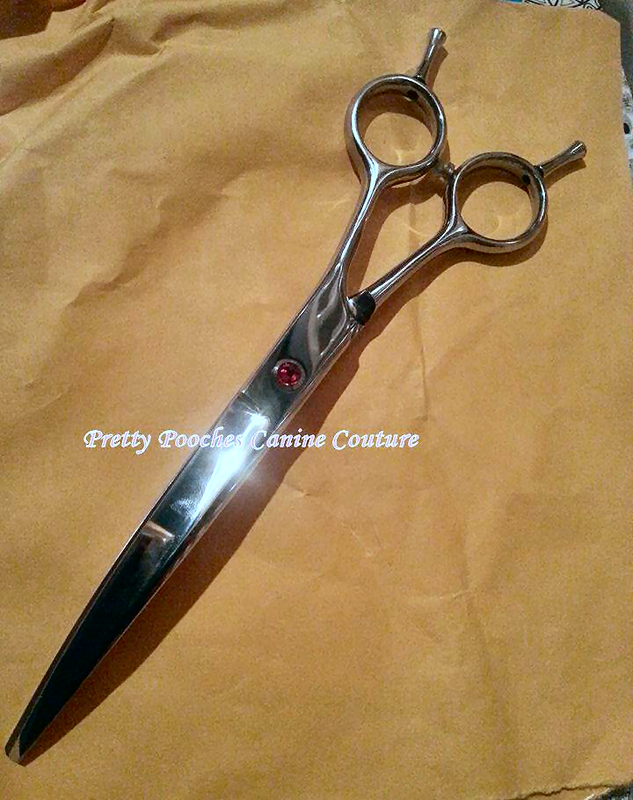 I run Pretty Pooches Canine Couture, and one of the new things I have in stock are professional grooming scissors - at much much much lower prices than many of the other high quality scissors! After having a pair of my own for years when I was grooming. I knew they were lovely quality, so decided that these were a great quality item to stock. Well today I am proud to say I got a great review from the first person I sold a pair to since stocking them in my online shop! "Scissors arrived and I love them. Hugely impressed. Will definitely buy again x"
A big thank you to Cheryl H. for the review, and I hope they give you years of beautiful grooms. This is my lovely Maisie when she was a puppy. She had a letter through today, with her pre-op instructions. She needs a dental to clean up her back teeth. The rest of her teeth are in beautiful condition but as she doesnt chew with her very back couple of teeth they need to be cleaned before they become a major issue for her. Her op isnt for a few weeks yet though, but as Maisie adores the vet this isnt as much of a positive to her!!! This coming weekend (well, Thursday to Sunday) I will be dog sitting for some of my babies that are co-owned by my best friend while she is away. That means 8 little dogs racing around having fun, and 8 little furry hot water bottles to keep me warm at night! Monday I had an extremely rare chihuahua-free day. My best friend and I went to London with her daughter to see Wicked! I am a huge fan of musicals but this was the very first one in the West End! We saw Annie too a few months ago but that was in a small theatre locally. And to make it even better, Miss Hannigan was played by Craig Revel Horwood!!! Wicked can only be described as AMAZING! I can honestly say it more than lived up to my expectations, and they were rather high as I am a huge Idina Menzel fan and have seen her perform many of the songs from the musical. While we were away for the day, my sister was dog sitting. They spent most of the day sleeping cuddled up to each other. I get the feeling they were also rather spoilt as there were several packs of treats empty! This is the photo I was sent half way through the day - Please excuse Maisies cone, she is booked in for a dental as she keeps rubbing her face. The vets aren't sure what's causing it so hopefully a dental will help, as they cant find anything else at all wrong! Aren't they adorable! This is Yoda. He is a 3.5 year old ball of fur who adores his mum! 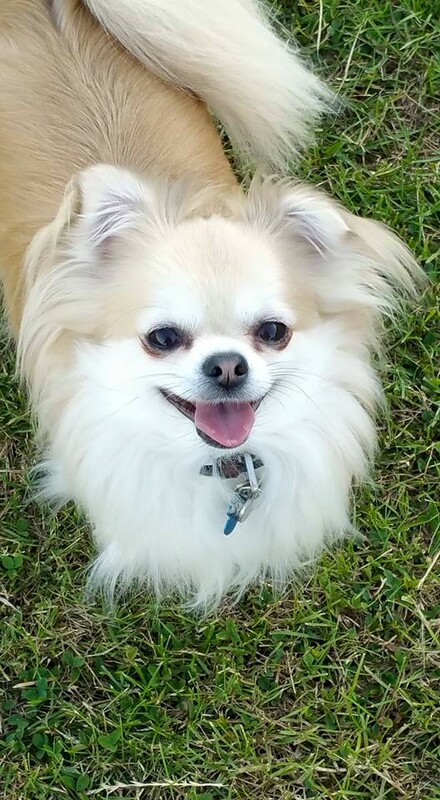 Yoda is the top boy in our pack of 8 tiny dogs and his favourite thing in the whole world are his treat toys. He loves the challenge of working out how to get his treats out of them, and of course the treats themselves! Yodas favourite treats are the Pet Munchies chicken strips. He would (and in the past has!) happily eaten his way though a whole pack in 15 minutes flat! This beautiful boy is a real people dog. He loves the company of people and a nice warm lap to sit on and enjoys the company of the other chihuahuas. However he really does not enjoy being woken up at all! Our little Yoda is one of our main product testers for Pretty Pooches Canine Couture, and he gets to test out all sorts of toys, treats, shampoos, coats, collars, harnesses and more before they get passed for sale. If they don't pass his high standards, they don't meet ours! 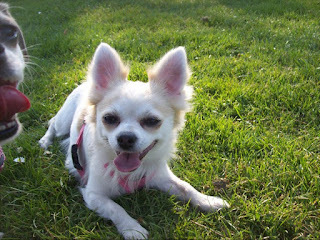 To visit Pretty Pooches Canine Coutures online shop, please click HERE. For our Facebook page with lots of offers and deals, please look on HERE. Or for more details on Pet Munchies please check out their website HERE. Welcome to the Pretty Pooches Point Of View! 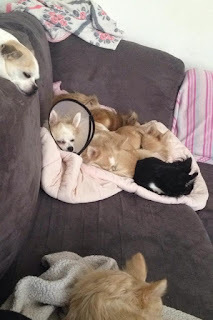 Here I will document the adventures of 7 very spoilt longcoat chihuahuas and one even more spoilt chihuahua cross pug! I will post when they will test and review different products, their daily adventures, photos, videos and much much more! Along with this I will be posting training tips and advice, grooming information, canine nutrition info, natural health advice and all sorts of other top tips and pointers to give your pet the top-quality care that they deserve! Oh, and there will be some bits posted from the cats' point of view too - All 3 of them have very interesting ideas of what they should be up to!